I have been using my 4-year-old daughter as a pawn and making her watch the Avengers Assemble cartoon on Disney XD Sunday morning when I have to get up with her. Don’t get me wrong, she loves that Avengers, but could care less about this cartoon. The cartoon is not great, but possibly gives some insight into the direction of the Marvel Cinematic Universe. 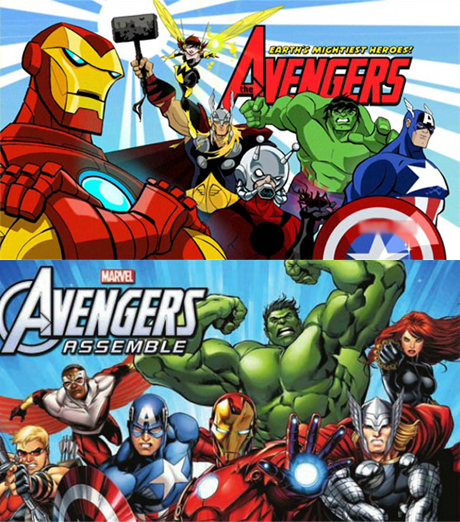 Assemble was the first cartoon version of the Avengers (this is the 2nd incarnation of an animated Avengers cartoon since the beginning of the MCU. The first was the lauded Avengers: Earth’s Mightiest Heroes) to feature Falcon who went on to play prominently in Captain America: The Winter Soldier. However, this version of the cartoon has come under fire for lacking some of the qualities of its superior predecessor. Assemble has attempted to be a bit more serialized with the heroes grappling with the Tesseract-fueled Iron Skull and the Cabal (M.O.D.O.K., Attuma, Hyperion, and Dracula). 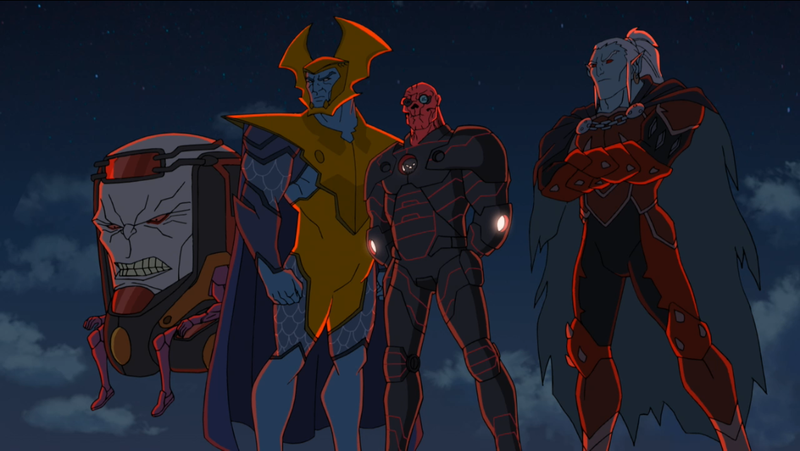 Avengers: Earth’s Mightiest Heroes established a world that included not only terrestrial threats, but also those from other dimensions like Malakeith, but also other worldly villains like the Skrulls and Kree. Only just this past weekend, did we get the first glimpse of Thanos on Avengers Assemble premiere episode “The Arsenal”, which is possibly a siren of what’s to come for the MCU. Thanos will be feature in the first half of the season as he strives to collect all the the infinity stones before The Avengers can stop him. This season of Avengers Assemble will also feature Thanos’s Black Order (a team of 5 henchman who made the first appearance in Jonathan Hickman‘s Infinity story and current avengers run) will make their animated debut as well, according to the Daily Marvelite. One particular character in this past weekend’s 2nd season premiere episode of Avengers Assemble that caught my attention was the robot “Arsenal”, who is an artificial intelligence machine, created by Howard Stark, to focus on energy consumption, and as a protector and playmate for his somewhat neglected son Tony. In the comics, Arsenal was created in the final days of World War II by a group of Allied scientists, led by Howard Stark, developed “Project Tomorrow”. Arsenal was a prototype fighting unit to be deployed in the event of an Axis victory. The robot was also guided by an early computer program called “Mistress”. When the Allies won the war, Arsenal was placed in storage. The robot was activated for a military demonstration during a worsening Cold War, but was never used. My theory is that this dormant peacekeeping program may be Howard Stark’s Project Arsenal which was a failsafe if anyone got their hands on the Tesseract during post-war, pre-S.H.I.E.L.D. days. Arsenal would capable of consuming the energy emitted by the Infinity Stone which could then be jettisoned into space and detonated, if need be. However, Howard Stark’s time with the S.S.R., then S.H.I.E.L.D. would lead him to discoveries of other foreign materials (which we may see more of in ABC’s Agent Carter series, and as we’ve already seen in the first episode of Agents of S.H.I.E.L.D.‘s second season) that will outpace production of Arsenal, making him obsolete, or so he thought. SIDE NOTE: Recent rumors have a scene in a draft of the Ant-Man script with a young Hank Pym meeting with Howard Stark, Arnim Zola, and Peggy Carter. I think that it is very possible that another one of the scientists involved in the creation of Project Arsenal is a very young Hank Pym. In fact (in my theory) it is Pym’s idea to give the robot a sort of consciousness that makes sure that he doesn’t kill indiscriminately. Pym has several ideas, of which Stark takes credit for many of them. Pym becomes bitter and strives to keep his inventions from S.H.I.E.L.D. and the Starks for the rest of his life. Remember, just how bitter toward the idea of superheroes and Avengers Pym sounds in the audio of the Ant-Man teaser that premiere this past July at Comic-Con. I believe that Tony sees Project Arsenal as a viable means to remotely patrol Earth, monitor energy fluctuations, like Strucker poking at Loki’s staff, and retrieve these materials while preventing any energy exposure to the public. In Iron Man 3, we saw that Tony had a hard time taking off the suit, or at least living life through the suit to the point that he sent, just the suit to subdue Eric Savin and save the lives aboard Air Force One. In his quest to meet the high demand of Hydra incursions, maybe Stark creates his own variation of Arsenal in Ultron by combining autonomous suits with a variation of the J.A.R.V.I.S. program to be a leader for the robot army his father was unable to create in Project Arsenal. Of course, the problem with Tony’s plan is that he doesn’t account for Ultron’s autonomy to exude itself quite in the way he expects. Ultron will think for himself and reason that the best way to keep the peace is to eradicate those who start wars, which ultimately has him chasing down and attempting to destroy humanity. Just think of Project Ultron as Project Insight, but with the sights focused on Hydra targets and the capabilities of a hellicarrier in one A.I. So, the stakes couldn’t be higher than in Avengers: Age of Ultron, unless we find out that Ultron is the only being who could possibly stand up to Thanos in Avengers 3. I’m sure Earth’s Mightiest Heroes will have something ready for the Mad Titan! What do you think of my theory? Will we see Project Arsenal in Age of Ultron? Do you have your own theory for the upcoming blockbuster? CBMB: Phase 3 of the Marvel Cinematic Universe Announced! CBMB: 6th Avengers Poster Reveals Quicksilver and The Vision!